My name is Adrien Lemaire, french Engineer living in Osaka and working at ShareWis. 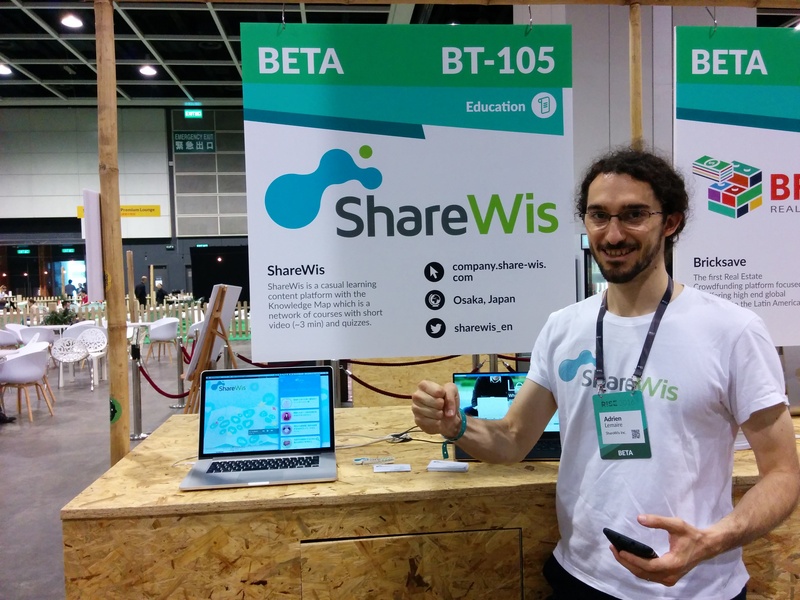 ShareWis is a Japanese EdTech company delivering e-learning contents to its users through two products ShareWis (mobile application for snack learning) and ShareWis ACT (web application providing intensive courses for beginners). I had the opportunity to join our CEO Tomoki Tsujikawa at the RISEConf event in Hong Kong from May 31th to June 2th. We flew from Japan in the 30th evening, arriving at Hong Kong around 12:30am. We went to the Flying Pan, a restaurant opened 24h, and were able to eat a huge breakfast and take a quick nap there. We then joined the FinTech morning Run at 7am and ran 9km on the Bowen Road. As a marathoner, this was my favorite run ever. On the top of a mountain covered in trees, with a beautiful view on the city, the track is amazingly straight without any slopes. Finally, after quickly changing clothes, we were ready for the RISE Conf! On the second day, we first met with BumRyng Yoo, CEO of Mobidays. He gave us some tips for mobile marketing, naming a few products like App Ape, Google UAC and Facebook Ads. Then we met with Phil Chen, Chief Content Officer at HTC and advisor at Horizon Ventures. By his previous experiences in EdTech, he had great insights to provide, too bad that the time allocated was only 15 minutes. On the second day as well, I joined a group of a dozen people to discuss about “Building Meaningful Products”. There are a lot of points of view (founders, employees, company, users), and it’s challenging to make a product meaningful for all of them. We exchanged various ideas, for example how to celebrate key milestones including celebrating failures. This is were we spent most of our time. Everyday, different startups would present their products from a booth. Startups were sorted by classes: Alpha for newcomers, companies often without investment or product release; Beta for senior startups like ShareWis which received investments and released products, and Start for companies which have become very popular and getting good revenues already. Due to the large number of EdTech companies present at the event, we started conversations with them, resulting in opportunities for future collaboration and partnerships that we’re looking forward to. On the third day, it was our turn to manage a booth. We got a lot of visitors and quickly ran out of business cards, this was impressive! In overall, the event went very well. The difficult part comes now to follow up with our contacts and create concrete partnerships in order to expand ShareWis business overseas. It is crucial to carefully prepare pitches before an event. Explaining the business simply and quickly saves a lot of time. We went to the event with Japanese business cards, but English business cards should be prepared for next time. Go to the event with 10+ boxes of business cards to avoid running out of them. Prepare goodies and flyers to make the booth more attractive and memorable. Prepare enough devices so that everybody can test your product without queuing. Do not forget adapters for the country you’re going to! It is really hard to remember every discussion done on booth day. Do not wait the end of the day to write notes, but write them immediately after the talk. You can even write the notes directly on the person’s business card. Reserve some slots throughout the day to communicate on social networks like twitter. Do not try to handle external work while going to an event. We had an important release for the ShareWis application, which ended taking a lot of time and distracting us. Next, we’ll be going to EdTech Asia on July 30th~31th in Bangkok, Thailand. Please come and meet us there!